These products were provided for free in exchange for my honest reviews. Skinsider were looking for reviewers. In exchange for free products to try I would be going to London every few months to record review videos for their website. Considering you never really see my face on this blog or Instagram it didn’t seem like a natural thing for me to do. However, I decided to get over my fear and apply as it sounded like an incredible opportunity. A few weeks later I got the email I was hoping for – I was in! I, and three other people were selected. We were grouped according to our skin type and so I was with the lovely Maryam. We were on team oily/combination and got lots of goodies to try out, selected for our skin type. 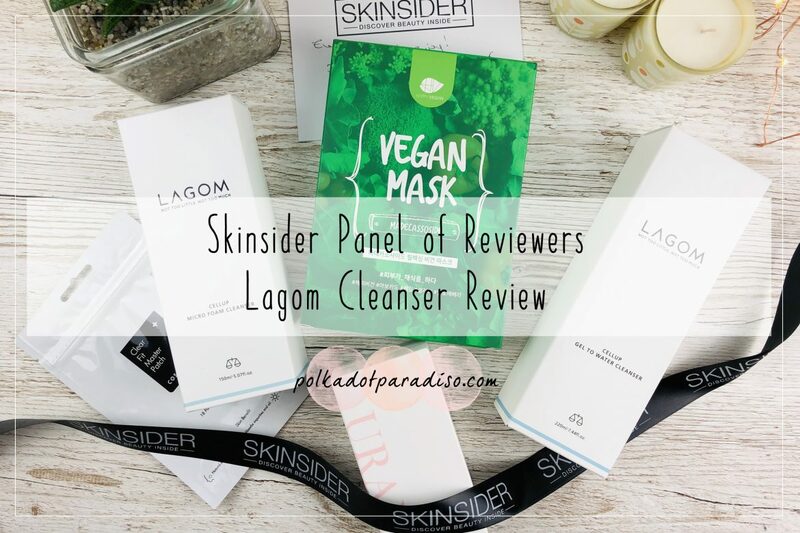 The first videos to go live were our reviews of the Lagom Gel to Water Cleanser and Micro Foam Cleanser. As someone who normally doesn’t get on well with cleansers I was surprised at how much I liked these. The tag line of this brand is ‘not too little, not too much’ and you can really feel that when you use the products. It never felt like I was putting loads of chemicals on my face and I could never feel any residue afterwards. Importantly, my skin didn’t break out after use. To watch the full reviews by myself and Maryam, click here. I’ve just taken delivery of my next batch of products and I’m so excited to get trying them all!